Repair of the old villa with their own hands (+ photo) | A site about a garden, a summer residence and house plants. A site about a garden, a summer residence and house plants. Planting and growing vegetables and fruits, caring for the garden, building and repairing villas - all with their own hands. Garden houses, built in the last century, do not differ in beauty and comfort. 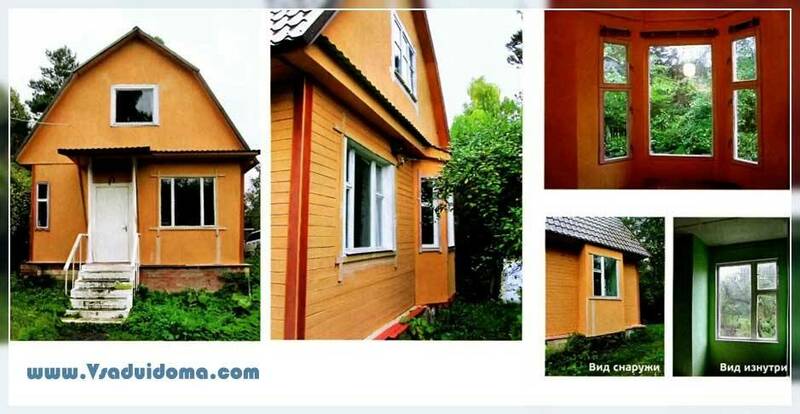 Eugene Orlov tells how it is relatively inexpensive to reconstruct the old dacha on its own and radically improve the quality of life in it. Our summer cottage with a penthouse was built at the beginning of 60-ies of the last century in one of the horticultural partnerships of the Moscow region on a site in 8 acres. Dimensions of the house in the plan - 6 x 6,5 m. On the first floor there was an entrance hall (it is a veranda) and two symmetrically located rooms (Figure 1). The walls of the first floor were assembled from wooden boards with an internal backfilling of chips. The outer walls of the hallway are wireframe. Outside, the house was trimmed. The entrance hall was lined with planed planks from the inside, and the rooms - with chipboard (particleboard). Unsuccessful planning, the lack of a bathroom and a heating system made the house extremely uncomfortable for use. We reconstructed the house on our own and with minimal expenses, trying to use old materials as much as possible. As a result, rescheduled the first floor (Figure 2), increasing the total area of ​​the house, arranged a bathroom and heating system, corrected the appearance, remodeling the walls of the hallway. In the space of the former veranda, they arranged a separate room and a small hallway 14 m2. making two partitions. To the room did not get too close, at the expense of the extension to the house increased its area by about 3 mg.
At the entrance there was organized a vestibule depth of 70 cm with two doors. The entrance hall with the stairs leading to the second floor was reduced. In the first room, the bathroom was fenced off, and in order to somehow compensate for the reduction of its area, a trapezoidal bay window with a depth of 60 cm with three window apertures was arranged in place of the previous window opening. The distance from the bathroom to the outer wall exceeds 2,2 m, and this is quite enough for the organization of a berth. The area of ​​the room in the end turned out about 8 m2. The door of the second room was moved, making it in the partition separating the first room from the second. In the second room, a rectangular bay window with a depth of 30 cm was also constructed, increasing the total area of ​​the room to 12 m2. So on the first floor of the house we arranged three separate rooms. Since the wall of the former hallway was taken outside, it was necessary to make a foundation for it. Whether it is made of a full-bodied brick with a horizontal waterproofing device made of roofing material. The foundation and the basement of the bay window of the first room are from used concrete curbs and bricks. The basement of the second room's bay window is made of two steel pipes at the corners of the bay window, the basement is made of available stones. The ground beneath the house is sandy and non-heaped, so we managed the simplest uncomplicated foundation construction. The walls of the annex and two bay windows are skeleton, with a thickness of 100 mm. Outside, the walls are lined with cement-chipboards (DSP) with a thickness of 10 mm. Internal walls and partitions are lined with boards of thickness 25 mm. From the inside, the outer walls were sutured with gypsum-plaster sheets (G8L). The walls of the bathroom were faced with cement-chipboards on the inside. Since the house is operated mainly from May to September, the outer walls are not insulated. The house has windows that have been left after the renovation of the Moscow apartment and slightly altered. The removed windows were dismantled into separate sashes with one glass. In the bindings of the doors, additional quarters were chosen. In the selected quarters, a second glass was installed, forming a sort of glazing unit. The use of used wooden windows significantly reduced the cost of reconstruction of the house. In place of the former doorway from the hallway into the second room, a cast-iron fireplace with a glass door was installed. Its weight is 98 kg, which allowed to put the fireplace on the plinth floor without a separate foundation. Under it on the floor made a cement screed, covered with ceramic tiles. Chimney - stainless steel thickness of 1 mm. It passes through the second room, a bathroom and serves as an additional source of heat nak for the second vestibule, and for the bathroom. We used the existing summer water supply of a horticultural partnership. The cold water was put into the bathroom with a sink, toilet bowl and a shower tray. The quality of water from the water pipe leaves much to be desired, so we use it only for technical purposes. It was not possible to have a water closet at the dacha before. Now in the house there is a bathroom with a tap of domestic sewage in the septic tank. Sewerage was installed from plastic pipes Du100, and the septic tank was assembled from reinforced concrete rings, laying it in 20 m from the house. Eckers changed the appearance of the house - now it differs markedly from the typical summer cottages of the Soviet period. Fireplace with live fire brought comfort and warmth to the room, which is especially pleasant in the beginning and at the end of the summer season, and the bathroom in the dacha made our house a modern home. The tambour, covered with solid wood, the walls of the common room and the hallway increased the thermal characteristics of the house. And the use of cement-particle board (CSF) and GVL in the wall lining improved the fire resistance of the house, increased the strength of the walls and their durability. Fig. 1. Plan 1-th floor of the house before the reconstruction. Fig. 2. Plan 1-th floor of the house after reconstruction: 1 - tambour at the entrance; 2 - partitions; 3 - internal tambour; 4 - bathroom with sanitary appliances; 5 - trapezoidal bay window; 6 - rectangular bay window; 7 - columns of asbestos-cement pipes; 8 - cast iron nimes; 9 - chimney. Budgetary reconstruction. A modest country house has undergone noticeable changes. Now this summer is a full-fledged suburban dwelling with isolated rooms, where you can comfortably accommodate guests. Below other entries on the topic "Dacha and garden - with their own hands"
Subscribe for updates to our groups. Opening grapes after wintering - what to do first?